Agudat Yisrael tries to block Norwegian bill as 'revenge' for Degel HaTorah MK's attempt to be elected to Judicial Selection Committee. United Torah Judaism may be on the verge of splitting apart after its Agudat Yisrael faction attempted Sunday to prevent a Cabinet discussion on Justice Minister Ayelet Shaked's Norwegian Law bill. 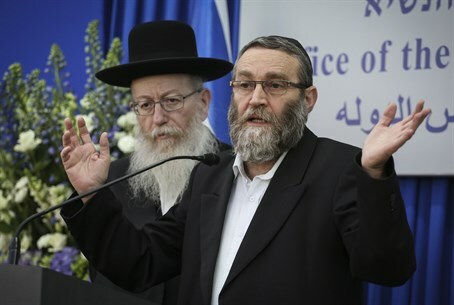 Should the bill pass, it would allow Deputy Health Minister Yaakov Litzman to resign from the Knesset and enable former MK Yaakov Asher, of UTJ's Degel HaTorah faction, to return to parliament. Agudat Yisrael officials attempted to thwart the bill as "revenge" for MK Moshe Gafni's efforts to be nominated as the coalition's representative for the Judicial Selection Committee, in spite of the fact that MK Yisrael Eichler was already nominated for the post by UTJ. While the Cabinet passed the Norwegian Law, it is unclear how the bill will pass its first reading in the Knesset on Monday, if four UTJ MKs will not support the measure. According to some political analysts, there are efforts to mobilize Yisrael Beytenu chairman Avigdor Liberman to support the law. Meanwhile, Absorption Minister Ze'ev Elkin made clear Sunday that if bickering between Eichler and Gafni continues, the coalition will select a third candidate from UTJ as a nominee for the committee. "Likud will not select the UTJ representative for the Judicial Selection Committee, but if two candidates are presented, the coalition will not support either of them," Elkin told haredi radio station Kol Hai. Elections to appoint Knesset representatives for the Judicial Selection Committee are expected to take place Wednesday in the Knesset.